I made Kuih Sago Lapis again with a slightly modified recipe. 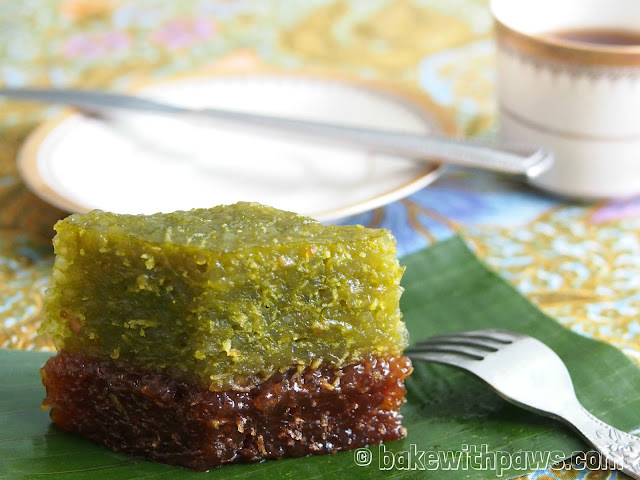 I used dark brown sugar instead of Gula Melaka and doubled the amount of pandan paste. The color of dark brown sugar is darker and you can get it at a local sundry shop. I found that it tastes better than Gula Melaka. I highly recommend this recipe as it is much better than the previous one that I shared. 1. Rinse and soak sago in water for 30 minutes. Drain and strain. 2. Prepare the dark brown sugar syrup: Add dark brown sugar, water and pandan leave into a small saucepan. Cook over low heat until sugar melt. Sieve and set aside. 3. Mix soaked sago, grated coconut, coconut milk and salt in a big bowl. Separate into two portions - one quarter (¼) and three quarter (¾). 4. Portion A (1/4) – Add dark brown sugar syrup into the first portion of sago mixture. Mix well and set aside. 5. 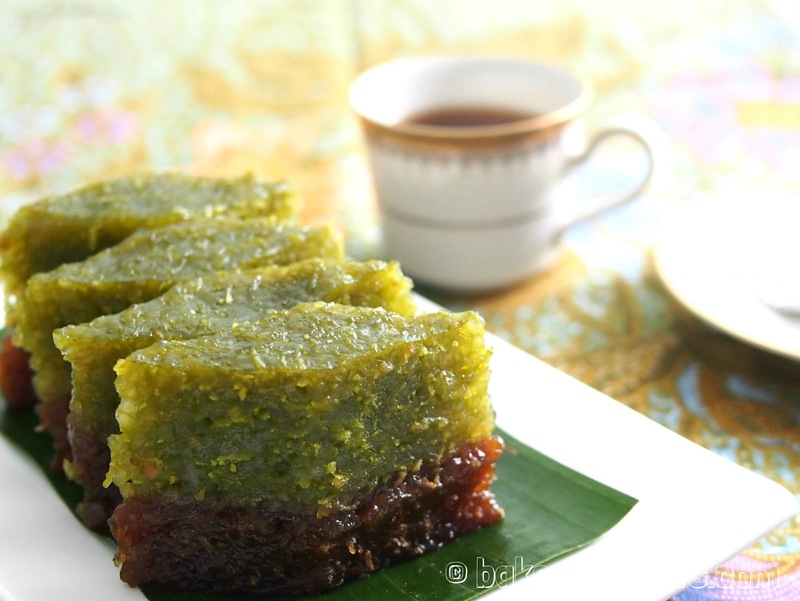 Portion B (3/4) – Mix the second portion of sago with pandan paste and sugar. Set aside. 6. Line the 7 X 7 inch square pan (base and sides) with banana leave and lightly grease with oil. 7. Pour portion A into the pan evenly and steam at a prepared steamer over medium heat for 15 minutes. Remove pan from steamer and pour portion B evenly. Return into steamer and steam for another 35 minutes until sago turns translucent. 8. Remove from steamer and let it cool. Unmould and cut the sago kuih with a knife greased with little oil. I reduced the coconut milk to control the amount of liquid or the kuih might turn out too soggy. Please add more sugar if you like it sweeter as I used the minimum amount of sugar in this recipe. Sago kuih can be kept in fridge overnight in an airtight container. However, sago hardens in the fridge but can be restored by heating in a steamer before serving. You stated 10-12 Tbsp concentrated pandan paste. Is it really TABLESPOONS or it is actually teaspoons? As this is a paste, and not pandan juice. So I am wondering if this is a typo. Also, I can't get a link to the method of concentrated pandan paste. Can you help w this please? Appreciate you much!! Thank you for the clarification. Sorry for the error. It should be pandan juice. You can put less than 10 tbsp if you think it is too much. I have already link the recipe on the above post for pandan juice.